The Aston SwiftShield bundles two crucial microphone accessories into an all-in-one premium solution. The Aston Swift has set a new standard for shock mounts. A complete re-design has lead to a product which has unparalled ease of use when compared to competitors, while retaing the most important feafure of a shock mount - isolation. The first thing to note about the Aston Swift is there are no rubber bands! The shock system as been reconceived, and worked from the ground up on an entirely new design idea. The ‘ShockStar’ suspension eliminates the need for fiddly rubber bands, but offers a high level of elasticity for maximum isolation. To keep things durable, as is the way for Aston, the Swift combines Aluminium and high grade glass-fill nylon polymer, with a unique medical grade latex ‘ShockStar’ suspension for ultimate support, reliability and shock absorption. One of the annoying things about shock mounts is the placement of the microphone - there are usually fiddly little screws that must all be wound to hold the microphone in place. The Aston Swift has opted for 2 quick release spring clips designed to fit a wide range of mics, from 30-55mm diameter, mounting your microphone takes seconds. The Aston Swift is designed to fir with the Aston Shield, and can be purchased as a bundle for a one-stop-shop for your microphone. 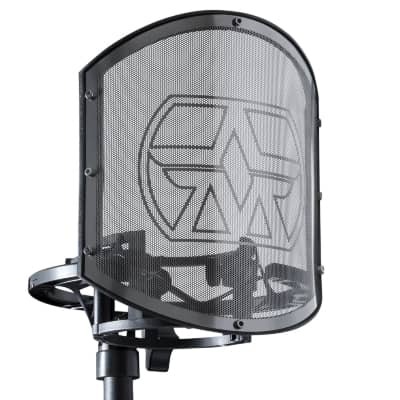 The Aston Shield GN is the pop filter so many people have desired for a long time. It has been painstakingly engineered to give you a perfect fit on any mic stand in seconds, and has one of the best quality goose-necks on the market to date. There will be no more hanging pop shields, and no more re-adjusting every 5 seconds. The shield attaches to the stand via the large, sturdy crocodile clip - no more fiddly thumb screws! This also serves another purpose. The pop filter itself features a unique, solid stainless steel shield, with precisely acid etched hexagonal filter holes, to give crystal clear vocals, with perfect acoustic performance for plosive (pop) control. The stainless steel body also gives it unparalleled protection against falls, knocks and dirt, something most pop filters cannot offer. It also presents a large surface area and curves around the mic, so vocalist movement is never an issue. To top it off, the filter is re-washable, saving you money on replacements while staying hygienic. The Aston Shield is compatible with the Astron Swift Shock Mount, and can also be purchased together with this. The perfect bundle for my Origin! Nice design and feels sturdy. Does exactly what it's designed to do. Worth the money.